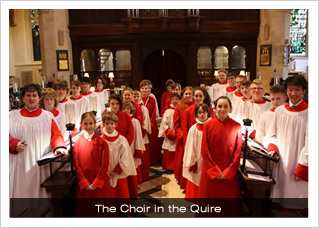 It has been some years since All Saints sang at Christ Church Cathedral, so on the first Sunday after the Easter break, ten senior boy choristers were joined by ten of the senior girls, as they travelled to Oxford to take the place of the Cathedral Choir (still on vacation) for the day. 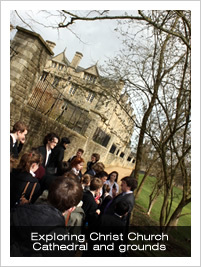 Following a much-anticipated packed lunch, the choristers headed off into the College to look around. 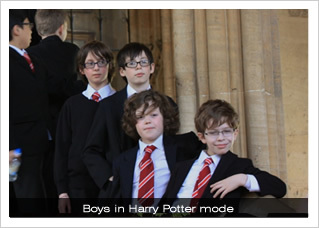 Particular areas of interest were the Lewis Carroll/Charles Dodgson and Alice in Wonderland connections in the Great Hall, and of course the many areas in the cloisters and quadrangles which featured in the various Harry Potter films, and of course the 16th century staircase which leads up to the Great Hall – see some of the boy choristers in the photograph above. Of course, Oxford is not just about the Cathedral, so, as is his wont, the Director of Music was soon marshalling his troops across Oxford, as they explored the major sights of the city – even a touch of celeb-spotting as Ian Hislop was seen in the distance. Reliving his student days, Mr Dunleavy soon had every chorister provided with an ice-cream, courtesy of G&Ds, the famous/infamous ice-cream café! choice of repertoire; whilst British choral music is widely performed in America, little American music is heard on this side of the pond, and rectifying this has become something of a personal mission for the Director of Music. 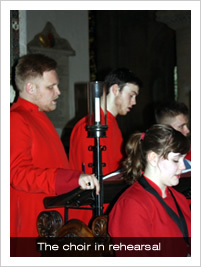 All in all, the day was a great success, enjoyed equally by those who performed and those who heard the choirs. 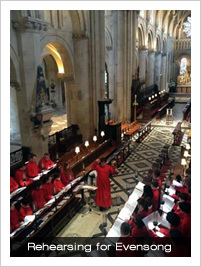 Particular thanks to Penny Barnes, Ruth Kentigern-Fox, Sally Sumner, and Veronica Trotter for chaperoning the choristers, and to all who assisted in making the day such a success.